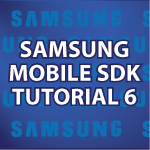 In this part of my Samsung Mobile SDK tutorial I will focus in on the S Pen. I’ll cover how to use the S Pen settings popup. We’ll also look into how to change the look of buttons depending upon their state changes. After I cover the basics of buttons in the next tutorial we’ll make a tool bar. In general we are putting together all of the pieces that would be required to create a professional Android paint app. All of the code follows the video below. //settings for the page document. I finally got a chance to signup for samsung galaxy challenge. I am writing an app for android device and currently I don’t have one. I am looking for one cheap one so that I can test my app on real device. It will be really exciting to see my own app running on the mobile device. How was your experience when you saw first time your app on the mobile device? I learned a lot from your sessions. I signed up for a Samsung Developers account. Hi Derek. Love your vids! I’m developing an app and I can honestly say that thanks to your vids I’ve gotten over the “hump” of programming that I otherwise wasn’t able to a few months ago when I tried iOS development. I’m finally googling less and coding more thanks to you! Thanks a great deal for the effort and the time that you are invest to make these video tutorials. I signed up with Samsung developer account. I really love your video tutorials. I’m an undergraduate. Your tutorials help me to understand core concepts, and now I can make my own Android/web applications as well. I take this opportunity as a privilege to win a Samsung Galaxy. I made a samsung developers account. I’m sorry, but for very serious security reasons I must personally approve all comments. hello admin,Actually i was asking the code that runs behind it.I have seen this in many websites,blogs in contact us section were u can write comment n submit it. Yes you can do that. You basically have to dramatically limit the characters someone can use, or you must dynamically change them when they are sent to the server before they make it to the database. Hello admin, i have installed eclipse but i found it very buggy would you pls provide a link or any tutorial like dat it wud be very helpful. (m using win8 pc). Hello, I have this tutorial on how to install android development tools.